CIRCLE IN THE STORM (D. Trimmer) Tet. Sdlg. 2-1 (Dragonfly Dawn X Tetra Texas Kaleidoscope) 35” 6” E Re. Ev. 14 buds. 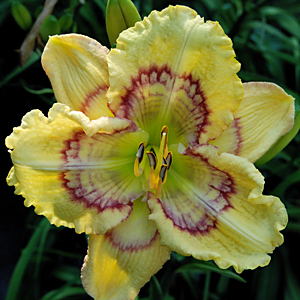 An extremely fertile and wonderful parent, CIRCLE IN THE STORM, is an ivory yellow bloom with a violet plum and purple patterned eye that is carried onto the sepals. The pattern varies during the season and as pictured is at its best. It is however, as a parent, where this cultivar shines. 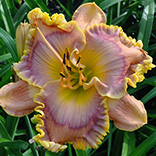 Wonderful Patterns on very large faces were all over the seedling beds this past year coming from CIRCLE IN THE STORM. Named after another of our son’s wonderful songs. CIRCLE IN THE STORM is very limited.